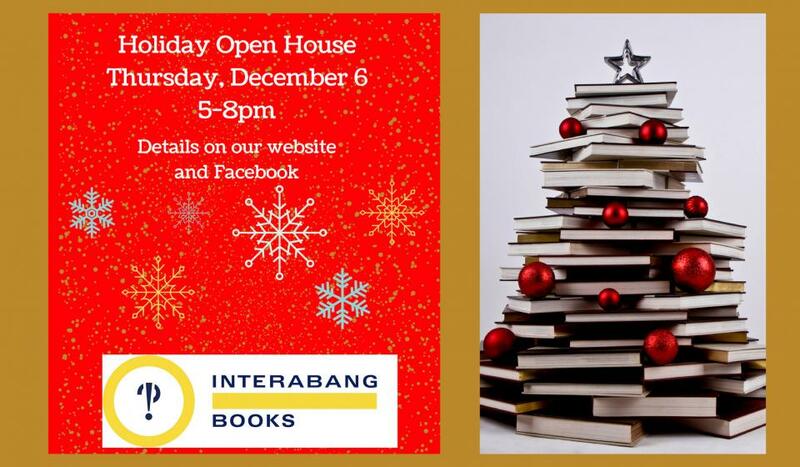 Mark your calendar or set a reminder to visit Interabang on Thursday evening, December 6, for our bookstore's first annual Holiday Open House. Between 5 and 8 PM, we will serve a variety of beverages and refreshments for you to enjoy amid the displays of our favorite books and gifts. Almost every member of our staff will be on hand, too, to recommend a book or two or to offer a little chat as you sip and shop. All are welcome, including the kids -- and if you have friends or family you would like to introduce to Interabang on this special night, please share this info and extend an invitation to them. We'd appreciate that. P.S. We are set for holiday shopping right now, so yes, you can come to the bookstore today to be among the first to see our favorite selections for Christmas and Hanukkah in this season of giving. But by all means, come (again) for our Holiday Open House on Thursday, December 6, from 5 to 8PM!